One of the very cool things about hackathons is that you learn what type of technology that people are really using. We’re all wondering what the hot “trends” are going to be at one of these things. At the Disrupt Hackathon, we’re learning quite a bit. An early trend is SMS. Surprise! 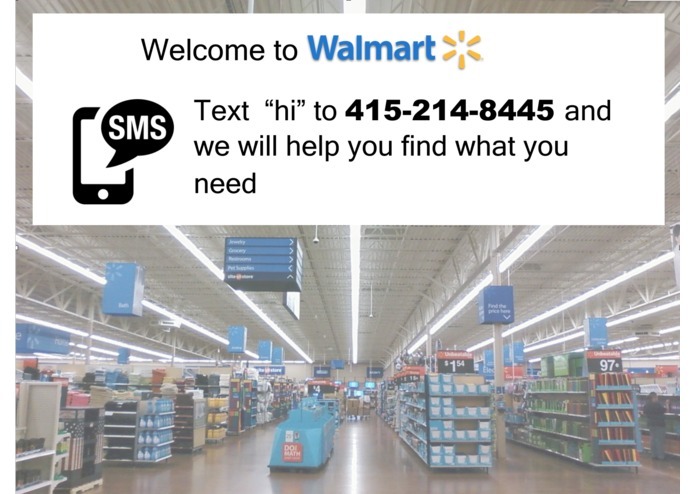 There’s Magic, Facebook M, Operator and now Walmart Simple Text. The latter is what you’d expect — an assistant for shopping at Walmart, which is a ridiculously large store with tons of items. All you want to know is whether they have the candy you want and what aisle it’s in. This is predictable since all Walmart stores are laid out the same, pretty much. Need more help than the assistant can give? Text “chat” and you’ll be connected to a live customer support agent to answer more nuanced questions. You can also see what aisle you’ll be visiting thanks to a Walmart store map. I chatted with the team, which consists of hackers Clara and Rachel Tsao and their longtime friend from high school Devin Finzer. The gateway to the official Walmart app, perhaps?